Houses of Art Gallery,Marbella Club Hotel, shows “A Light in the Space”, the Personal Exhibition of Helidon Xhixha. | Marbella Marbella – Adelante! 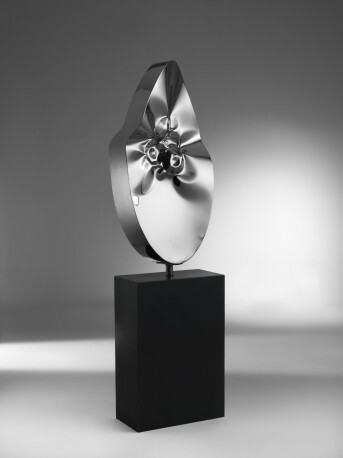 Houses of Art Gallery,Marbella Club Hotel, shows “A Light in the Space”, the Personal Exhibition of Helidon Xhixha. from Thursday, 14th of August, until the 16th of September, 2014. 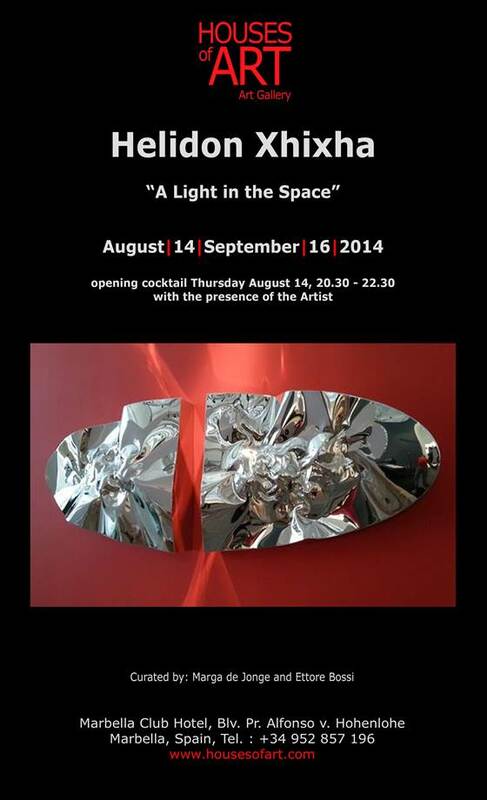 The artist will be present at the reception cocktail on Thursday, 14th of August, from 20.30 until 22.30. “I don’t sculpt materials. I use materials to sculpt light” – Helidon Xhixha. 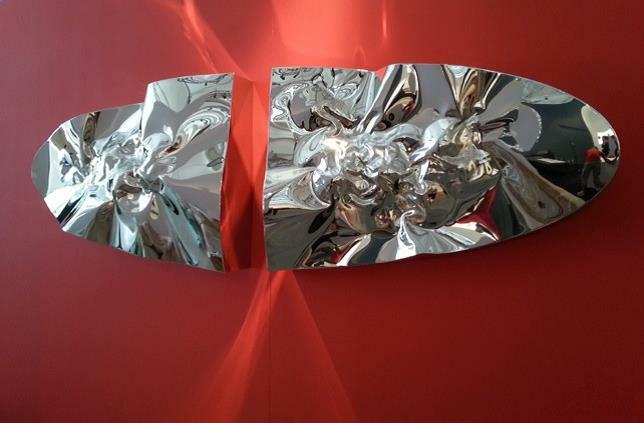 PURITY,2012, 2 Semi oval High Relief, Mirrored Polished Stainless Steel, 289x89x20 cm. Xhixha’s desire is to capture and sculpt light through an intervention upon steel by folding it, turning it inside out and marking it so that the very form of the sculpture becomes of secondary importance while it’s capacity to reflect and illuminate takes on a primary role. His art works converse with the world, embracing it and reflecting external environments, colours and brightness. “Xhixha has made certain aspects of great prominence his very own. First of all, the emphasis placed upon the aesthetic tension derived from the relationship between the physical expressiveness of the materials used and the effects of light. Such is the case of Brancusi’s polished bronze sculptures which have influenced so many artists such as Arnaldo and Giò Pomodoro. The reference is significant, even though the material differ and there are no direct stylistic connections. Another aspect that should be pointed out is the utmost development of spatial suspension and the conception of sculpture as a dominant gliding relief, a well-defined modality of configuration which derives from classical low and high-reliefs. Examples are found in experimental forms in many works. all of its own: special moulded luminous effects derived from an energy charged way of working the iron; a process of folding and moulding the sheets by twisting them with a detailed, thriving delivery of curved and convex undulations that project and cave in. 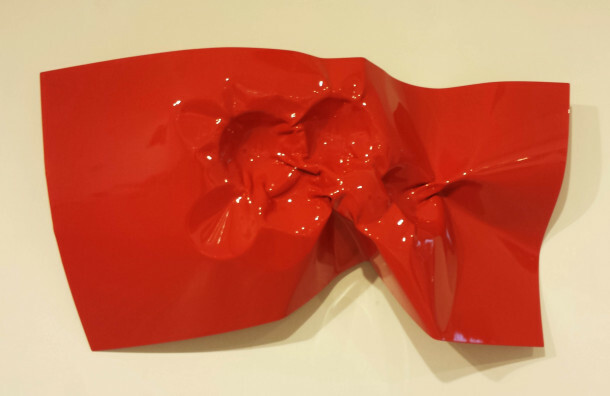 These works are created with tools from garages and body shops.” Francesco Poli. “Despite the exceptional hardness of steel, Xhixha’s works do not betray the use of any mechanical object or tool which forced them to take on their particular form. It is as though the artist had moulded the material only with the force of his mind, a mind endowed with the power of folding it into inexhaustible and at the same time amazingly particular shapes. His sculptures, in fact, are part of that apparently casual organic unity that seems inherent in natural forms: the allusive and enigmatic fascination of a stone abandoned forever to the caress of the waves and to the rubbing of sand blown along by the wind. And yet at the same time they have an architectural rigour which, however, appears to be innate in creative energy, a result of the artist’s striking intuition of the artist rather than of a deliberate, planned aim. Xhixha, in fact, being immune to any kind of arbitration with the materials of yesterday’s fashionable and extremely modern artists, sublimates force and energy to light, the element we have already often referred to, in a quite unusual way.” Enrico Badellino.